I have sworn off ever buying mass-produced hummus again, and this was BEFORE THE LISTERIA RECALL from Trader Joe’s and Target (you can read about that here, if you want). Why? Because when I do try them, they almost all have the same problem: no taste, or a taste so very weak it’s not worth eating. For me, the key difference in hummus is whether you want it to be the consistency of a creamy dip, that drips off your carrot after dunking, or of a peanut-butter like paste that holds its shape and can hold a piece of celery upright. Though I think hummus should be creamy, the best reviews I’ve gotten have been from making it more paste-like. I love hummus because it’s within the parameters of a diet, and aside from its fat grams, is one of the healthiest things you can eat with vegetables. 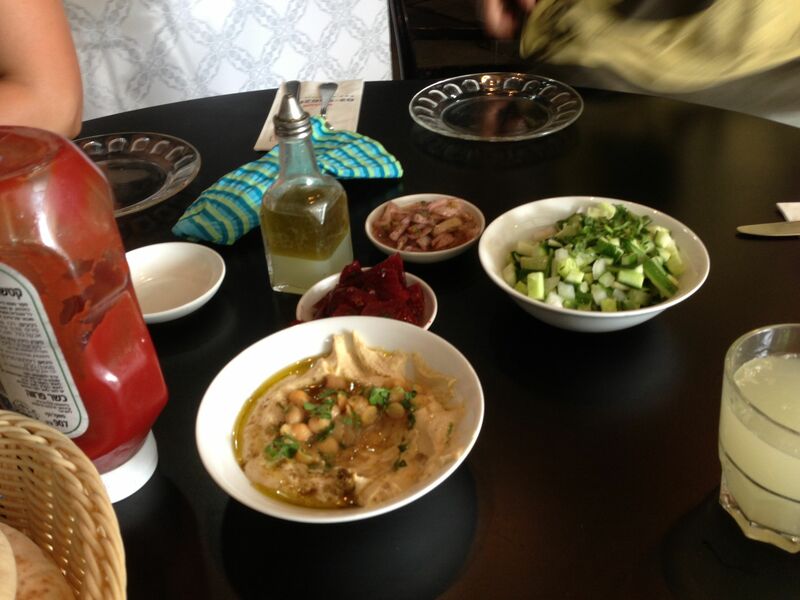 My mind was totally blown on a recent trip to Israel by how world-rockingly different and delicious their hummus was. Like my experience in Seattle where ALL Kale Caesar salads were terrific, even the worst hummus in Israel was fantastic. It’s a mystery— how is it so simple and so complex at the same time? Why do I want to put it on absolutely everything? Why was I so sad when the bowl was empty? It should also be said that the Pita there was warm, strong and doughy, with incredible body and texture: i.e., NOTHING at all like the thin, flavorless soft-particleboard they pass off here. Determined to create an incredible hummus to match my experience in Israel (hint: don’t serve it cold) I searched for Middle Eastern recipes, though the one I found and tweaked was from a non-Middle Eastern health blog, the Amy Layne Paradigm Blog I had to keep it tweaking it to my liking, but I finally found the secret ingredients that made me (and my friends from Israel) happy. I make this in stages, by adding ingredients and then blending. You are obviously free to put everything in and hit blend all at once. First, after draining chickpeas, rinse them. I find this is a very important step in using canned chick peas. I am told that in the Middle East (where I doubt they ever use canned chick peas) they remove the outsides of each chick pea (the skin) for an even creamier consistency. I have tried this, and it does make a difference, but not one that warrants the effort. Place the peeled garlic and peppadews in a cuisinart. Blend. Add the olive oil and soy sauce. Blend. Add the tahini and blend. Add the chick peas and blend till mixed and pasty. Then add the chick pea water, and juice of one lemon. Blend. Add the spices and blend. Let the cuisinart run for a while. Spoon into a bowl; in Israel it was customary to serve hummus in a bowl with whole chickpeas and olive oil, sometimes with parsley and paprika, too. You may need to step away from the bowl, or get your own bowl. But whatever you do, don’t go back to the store. UPDATE: After I published this recipe, I got a lot of flak from various corners of people claiming it was “inauthentic” and “preposterous” for its use of soy sauce. Both of those things may be true, but I am telling you that it is hands down one of the most popular things I make. Besides the approval of Israelis, I recently encountered a woman who had been experimenting with hummus to get “just the right flavor” but to no avail. She was so happy when she tried mine— she had been going authentic and not getting the results she dreamed of. Now let me clear—I do not advocate making cake from a box mix or mac and cheese in a microwave (a shanda), but I stand by this recipe, with all of its flaws. Posted in Sides & Salads and tagged best hummus, chick peas, garbanzo bean dip, garlicky hummus, Hummus, Israeli hummus, Robert deutsch on May 21, 2014 by Robert Deutsch. ← Need a Recipe for National Chocolate Chip Cookie Day? Here’s One!